What are good games to play with the family? Hey PC Gamer, I'm headed home for Christmas, and I'm bringing my laptop (mostly to entertain myself). But I could hook it up to our TV for some local multiplayer... maybe show my brother what he's missing on his Xbox. Can you recommend some games that would be good for the family? — Roger M.
That settled, we have a lovely list of great couch games—not all PC exclusive, but still. Towerfall is my first pick: easy to learn, hard to master, and an excellent way to get a room full of people yelling at the TV. Nidhogg and SpeedRunners live in the same category, Screencheat is a novel take on the GoldenEye experience, Castle Crashers is a mad co-op hack and slash, and Gang Beasts is hilarious. I highly recommend Gang Beasts. We also had some fun with Brawlhalla recently, which is essentially a simplified, PC take on Smash Bros. It might not impress a Smash Bros. fan, but it has its moments. 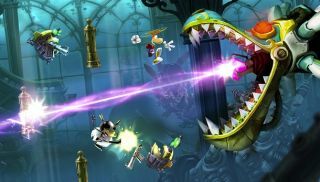 And if you have little kids around, the most friendly things I can think of are Rayman Legends and Rayman Origins, which are both great. Then there are the games in the single-player-but-still-great-in-a-group category. I'd bet one of Telltale's recent games, Tales from the Borderlands or Game of Thrones, would be fun when played by committee, assuming everyone in the room is cleared for the subject matter (and you aren't going to be sad about sharing just one episode). Though, my roommate recently streamed GoT, and the result was that everyone made him be the worst person. I think it kind of messed him up... so consider that. It's an obvious one, but I also really enjoyed sharing Portal and Portal 2. Even outside of 2's co-op, whenever anyone got stuck, we'd pass the controller around (I know, playing Portal with a controller, but it just made sense for the setting). You could also play Ultra Street Fighter IV if you want to rub in that SFV is a PS4/PC exclusive. Not sure how cruel of a brother you are. Anyhow, I could go on forever, so I'll leave it to the commenters to share their favorite local multiplayer games (I know you want to say, "I can't believe you didn't mention..."). My last bit of advice is to buy what you need now (Steam sale!) and have it downloaded before you get there—that is, if your parents' internet is a spotty as my parents' internet. What is it with parents and crappy internet connections?